This evening, the moon shines above the constellation Scorpius and in front of Ophiuchus – the “overlooked” constellation of the Zodiac. Once upon a time, the border between Scorpius and Ophiuchus was not a particularly well-defined section of sky, until the International Astronomers Union officially drew in the constellation borders in the 1930’s. Although you will not see Ophiuchus on the horoscope page in the newspaper, the sun actually passes in front of this constellation from about November 30 to December 17. What’s more, the moon spends a few days within Ophiuchus’ borders each month. 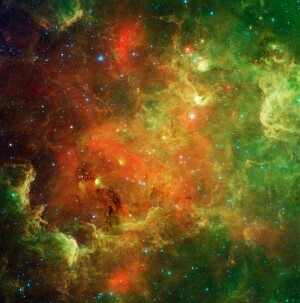 Scorpius, the brighter of the two constellations, serves as the better stellar signpost. It is much easier to visualize Scorpius as the Scorpion than Ophiuchus as the physician holding the serpent. Nonetheless – with the constellation borders placed as they are – the sun, moon and planets still pass within Ophiuchus’ borders, making it a member constellation of the Zodiac. As seen from North America this evening, the moon sits right next to the rather faint star Theta Ophiuchi. You may need binoculars to see it. Every year, the sun has a conjunction with Antares on or near December 1 and Theta Ophiuchi on or near December 13. 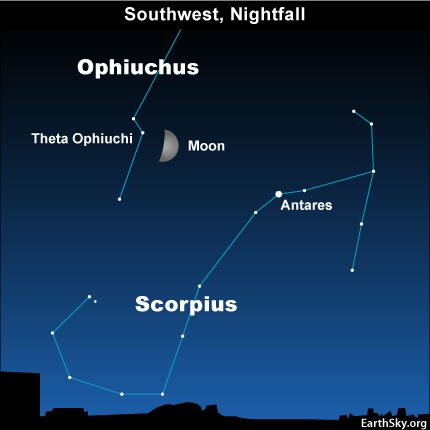 Tonight, the moon shines in Ophiuchus – the “overlooked” 13th constellation of the Zodiac. Bright star in east? Might be planet Jupiter, nearly at its closest since 1951. The Moon is at first quarter late tonight. Sunlight will illuminate exactly one-half of the lunar hemisphere that faces Earth. The sunlit portion of the Moon will continue to grow until the Moon is full on September 23. International Observe the Moon Night on September 18.